Lebanese food is delicious and ilili is one of the Accidental Locavore’s favorite restaurants. 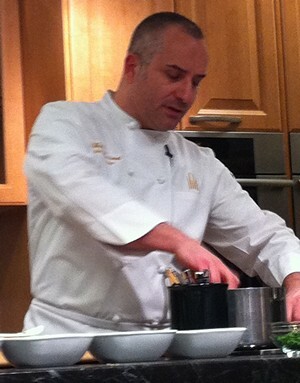 When the chance came to take a class at DeGustibus with Philippe Massoud from ilili, I was quick to sign up. The classes there are always interesting; while the chef stands there and works really hard (or looks like he’s working hard), you sit there, eating and drinking. ilili is Lebanese and this was the first time DeGustibus has focused on Lebanese food. We started with labne two ways. Labne is yogurt that has been drained, like Greek yogurt, however salt is added and then it’s beaten until smooth and glossy. It has a much more creamy, sour cream-like taste than Greek yogurt (which can sometimes taste like school paste). The first way was simple, with olive oil and crisp pita bread. In the second preparation Chef Massoud made small balls out of the labne, allowed them to dehydrate in the refrigerator for three days, rolled them in za’atar (a Middle Eastern spice mix) and served with soft pita, chopped tomatoes and onions. I preferred the simpler version which we always gobble up in the restaurant. 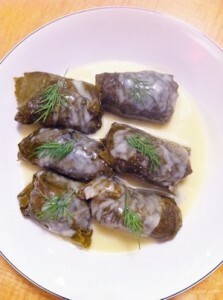 The next course was stuffed grape leaves; again two ways. I’m a sucker for almost any kind of stuffed grape leaf (stuffed vegetables, really) and made a batch of meat stuffed ones a few weeks ago. Did you know size matters for grape leaves too? Like zucchini, small is better. The large ones we’re all used to (and the ones I made) are considered to be very low class as the tiny ones are so much more labor intensive. And no déclassé folding in of the uneven sides for Chef Massoud. He trims them, giving him as close to a rectangle as a grape leaf could possibly be. Not sure that I have the time for that much refinement. To line the bottom of his pot, he slices a potato and then stacks the stuffed leaves on top so they don’t scorch. For meat stuffed ones, he suggested searing a lamb chop or two and using them to line the pot. What a great idea! On to a pasta course. While some angel hair pasta was cooking, Chef mixed labne with some regular yogurt and put it into a whipped cream maker to make yogurt foam (don’t worry, you can just use it straight up if you don’t have a foamer). The pasta was topped with the foam, pine nuts toasted in butter, toasted bits of pita bread and Aleppo pepper (the chic pepper of the moment). Sounds weird doesn’t it? However, it was delicious and might have been my favorite dish. For the meat course Chef Massoud made a lamb shank over a rice pilaf cake with eggplant, tomatoes and onions. I’ve made a different version of his dish with the lamb over eggplant which will be posted soon. Almost anything you do with lamb, especially lamb shanks is, good by me. By the way, if you can get eight lamb lovers together, ilili will do a whole lamb for you. Any interested readers? Dessert was baklava made with pistachios and cashews. It looked wonderful and everyone seemed to really enjoy it (as a victim of severe nut allergies in the past, I just look longingly at dishes like that). There was also an “experimental” arak sorbet, which like any of those anise flavors, is not one of my favorites. If there is anything that strikes your fancy, please let me know by commenting. I’ve got the recipes and can add them to the Cook-Along. Rinse the grape leaves well in hot water and let drain. In a large bowl, mix all the other ingredients together. Line a large sauce pan (big enough to hold all the stuffed grape leaves in one layer) with grape leaves. This is a good time to use any that are small, or ripped. Place one grape leaf on your work space, shiny side down. Put a tablespoon of the meat mixture at the bottom of the leaf (see photo). Fold the left side into the middle, then fold the right side in and roll up towards the tip. Place in the pot with the tip (seam) side down. Repeat until you’re out of filling. The stuffed grape leaves should be fairly crowded in the pan. Put a plate over them to weigh them down. Add hot water to cover, and simmer over low heat, covered, for about an hour until they are cooked through. Heat the 2 cups of liquid in a small sauce pan. In a measuring cup, mix the milk and cornstarch. Stir until smooth. Slowly add it to the broth, stirring constantly until the sauce thickens. Remove from the heat. Beat the eggs and lemon juice together until foamy. Slowly add it to the pan, stirring constantly. The sauce should be yellow and creamy. Taste it and add salt and/or more lemon juice to taste. 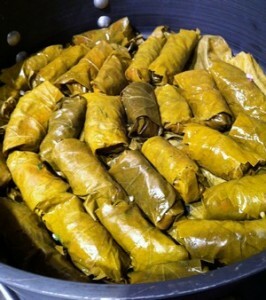 Serve it over the warm grape leaves and enjoy. My rating: 3 1/2 stars: Didn’t have enough lemons for the sauce, so it was a little bland. Fixed that the next day. Next time, I would also add some lemon juice to the meat mixture. This recipe has milk and cornstarch in the sauce, I’m not sure how traditional that is, and might just look for a simpler version in the future. If you end up with more leaves than stuffing, try wrapping a slice from a log of goat cheese in a leaf, and grilling it, delicious! Also, salmon with a little olive oil, dill, and lemon, wrapped in a couple of leaves and baked, grilled or steamed is lovely.